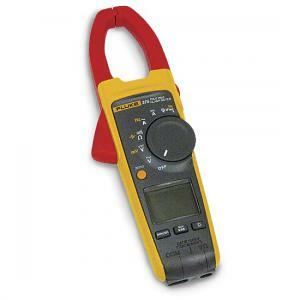 A True-RMS clamp meter that measures AC and DC current and voltage, ohms, and motor start up current. A True-RMS clamp meter that measures AC and DC current and voltage, ohms, and motor start up current. Also features an easy to use display hold and a large backlight display. Use the Fluke 375 Clamp Meter for troubleshooting in industrial, commercial, avionics and telecom environments. The New Fluke Model 375 features sleek body and jaws to fit perfectly in your hand and into tight places. Fluke has also improved low current measurement accuracy, added one-hand meter controls (index finger on clamp opening and thumb on rotary switch), features a large backlit display with hold to keep measurements on display, unique in-rush current function for measuring start-up current, auto shut off to maximize battery life and a three-year warranty. Jaw Opening size of 1.4"